Commercial Construction | Sarnia | Carosyl Home Additions Inc. Whether you are the operations manager of a multinational tech firm in Sarnia who is looking to build a new office for your staff or a downtown restauranteur looking to add some extra seating space for your growing number of customers, it is important that you take the time to invest in a construction team that you can completely rely on. With a wealth of experience in the delivery of a range of commercial construction projects, there is no job too big or task too small for our skilled team. By blending our decades of combined experience with the latest and most innovative construction techniques, Carosyl Home Additions Inc.. is in a unique position to offer all our commercial clients a construction service that they can really count on. So, if you are looking to add space and value to your Sarnia business then why not contact us today and allow our skilled team of construction professionals help you. In this day and age, Sarnia customers are more sophisticated and discerning than ever. With so many restaurants, cafes and bistros to choose from, the environment in which a customer eats almost plays as important a role as the food and drink itself. Put it this way, if your restaurant’s décor is too old or the space in your café is too cramped then you are running the risk of that customer’s first visit to your restaurant being their last. The best way of leaving a lasting impression on your Sarnia customers visit is by ensuring that their comfort and pleasure is maximized at all times. Carosyl Home Additions Inc.. are masters at delivering real and lasting construction solutions for your Sarnia restaurant, bar or café, and we will always do our utmost to impart all this information to you in the pre-construction meeting that we schedule with all our commercial clients. 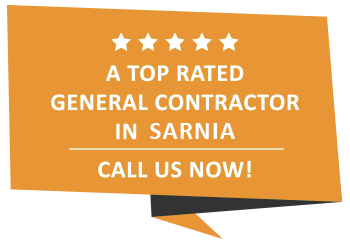 As the premier construction and renovation specialists in Sarnia, we can cater to your needs in a highly effective manner. Having provided business owners in Sarnia with the most optimal commercial construction service since 1986, it is safe to say that we know what we are talking to when it comes to enhancing all our commercial clients. At Carosyl Home Additions Inc., we take what we do very seriously. It is for this reason that we will never leave a stone unturned in the pursuit of construction perfection for your business. For us, commercial construction is much more than a job, it’s our passion. It is this committed approach to what we do that differentiates us from other providers in Sarnia, and our skilled and tailored approach helps businesses of all types, shapes and sizes come into their own and showcase what they’re all about. Catering to hotels, motels, retail spaces, offices, restaurants, bar and shops of all sizes, there is no commercial property that Carosyl Home Additions Inc.. can’t improve. Don’t settle for second best when the number one team in Sarnia is here for you to use.